Dissolved Air Flotation (DAF) systems are designed to remove suspended solids (TSS), biochemical oxygen demand (BOD5), and oils and greases (O&G) from a wastewater stream. Contaminants are removed through the use of a dissolved air-in-water solution produced by injecting air under pressure into a recycle stream of clarified DAF effluent. This recycle stream is then combined and mixed with incoming wastewater in an internal contact chamber where the dissolved air comes out of solution in the form of micron-sized bubbles that attach to the contaminants. 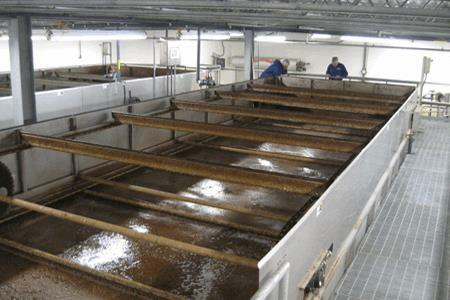 The bubbles and contaminants rise to the surface and form a floating bed of material that is removed by a surface skimmer into an internal hopper for further handling.